By now all members should have received their fabulous, new look Template together with forms for entering Quilt Show 2007. You can also download a PDF copy of the entry form from the side bar or the Guild's website. I am delighted that already a handful of members have submitted their completed entry forms. With each entry have between 25 and 35 items of unique information attached to it, processing quilt show entry forms is a significant data entry task for me as Exhibition Secretary. The deadline for lodgment of entry forms is Thursday, 1 March 2007. However, it makes my job much easier if everyone doesn't leave it to the last minute! Don't worry, this does not mean that you have to have your quilt finished by the beginning of March. The photograph that you submit with your entry form is primarily for identification purposes so we are not concerned if you still have some quilting left to do or the binding is not on yet. Needless to say, a photo of a stack of fabrics with a pattern and a dash of wishful thinking doesn't count however! If you have an query about your category or completing your entry form, you are welcome to e-mail me. We hope that as many members as possible take up this opportunity to share their quilts and to celebrate the Guild's 25th anniversary. Hold and maintain the records of the subcommittee. Maintain confidentiality of all information seen as part of the subcommittee involvement unless permission has been granted for disclosure. This must be documented for protection of both The Quilters’ Guild of NSW Inc and the applicant, as well as the subcommittee members. Arrange and attend monthly meetings of the subcommittee. Record the minutes of subcommittee meetings, type up the minutes and distribute copies to subcommittee members. Receive applications for Teacher Accreditation, check that all requirements are received. Organise assessment of applicants’ Stage 1 and Stage 2 work by at least two accredited teachers, and arrange the final interview as required. Type up assessment reports and critiques and distribute copies appropriately. Hold master copies of all subcommittee internal paperwork and provide as necessary. Complete the Progress Report, updating the records as applicant progresses through Stages 1 to 3. Hold and update a list of teachers accredited by The Quilters’ Guild of NSW Inc.
Liaise with the members of the subcommittee as required. Keep record of recipients of Stage 1 leaflet and paper work. Organise advisers (an accredited teacher from the list) for applicants who have successfully completed Stage 1, and assessors for the written stage 2 course outline. applicants who have successfully completed Stage 1, and assessors for the written Stage 2 course outline. One of the great new features of the Guild newsletter, The Template, is a consolidated calendar listing forthcoming meetings, Guild activities and other quilting events. This calendar is also available online as a 55KB pdf attachment here. Please contact the Guild Webmaster or the Template Editor if you have a quilting event that you would like to be included in the calendar. As another service to our members, the Guild has also set up a generic workshop booking form. This form can be used for the forthcoming Creating Pattern Workshop with Sharyn Hall and other workshops scheduled for 2007. See the Workshops page on the Guild website for more details. 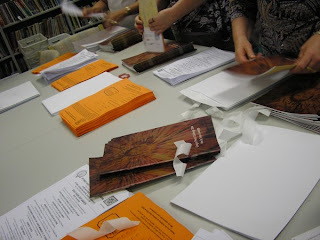 There's the evidence of the packing - the envelopes have a copy of The Template, information on the Sydney Quilt Show, and the all-important orange volunteer form (just look at those flying hands!) and 1000 filled envelopes, waiting for collection. The Template packing team is just one of the many volunteer subsets in the Guild who help make the Guild's work possible - thank you to everyone who helped today and to all those regulars who give their time. The second picture also shows you some of the Guild's library - click on the link to find out more and access the online booklist. One of the regular features in The Template is Quilting in Cyberspace, and with issue 25/1 we welcome Rowena, who has found some wonderful links about silks. Read her full column in The Template (posted out to you this coming week), and you'll know why she chose these: but here are the links, live, for you to click and enjoy. WEE WONDERFULS and especially this link on pojagi. In addition to the Guild's workshop fee of $110, a materials fee of $25 per student is payable to the tutor to cover costs of all dyes and chemicals and the use of equipment supplied on the day. Click here for a full requirements list. The Guild provides members the opportunity of two days in which to explore the world of colour using a contemporary medium for either traditional or non traditional impact. As well as fun, students will take home a bag of goodies for future creations. The workshop is on Sunday/Monday 11 and 12 February at the Epping Creative Centre. Please refer to the Workshops page on the Guild website for more details and complete and return this booking form. It's almost here! And what's that about Letters to the Editor? Have you been wondering where your December Template is? It got caught up in the Great Australian Christmas shutdown, but the printers are back now, the colour proofs have been approved and it's all go. Fingers crossed it will be in the post next week! One of the innovations in this issue is a Letters to the Editor page - it's not only a chance for your voice to be heard as a Guild member, but also every eligible entry (Guild members with an address in Australia) will go into a draw to win a 6-issue subscription to Australian Patchwork and Quilting magazine. How can you participate? Each issue a topic is set for you to write about. In this issue Lynn Hewitt has written about "The problem of UFOs". Read her piece, write your response (under 100 words) and send it to editor@quiltersguildnsw.com with "Letters to the Editor" in the subject line, and that's it! Easy as pie. 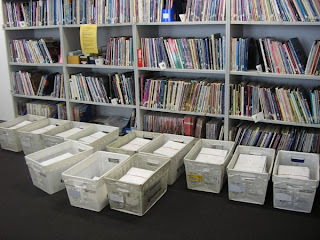 We may not be able to publish all the letters we receive, but every letter we receive goes into the draw. Please make sure you include your name, surname, town/suburb and state. The closing date for your letters about UFOs is 31 January - I'm guessing if you're reading this blog that you have email, but snail mail to the Guild offices is fine too (addressed to Template Editor, Letters to the Editor/UFOs, Quilters Guild of NSW Inc, Level 5, 276 Pitt St, Sydney NSW 2000). I've started work on the next issue - today was the deadline for copy, so if you've a quilt show date for the calendar or photos to send or you want to advertise - I need the information now! Editorial content to the Editor at the address above. Advertising enquiries should be directed to the Publicity Officer: publicity@quiltersguildnsw.com. Remember, if you are a guild member and have a blog you would like to share with others, you can e-mail the Guild Webmaster to be included on the member blog listings. To welcome in the New Year, it is my pleasure to give you a sneak peek at some of the contemporary quilts that will feature in the TripARTite exhibition by ZIGZAG (June Brown, Susan Mathews and Yvonne Voss) at Quilt Show 2007. The Outback Lives; Studies of the Outback Lives. 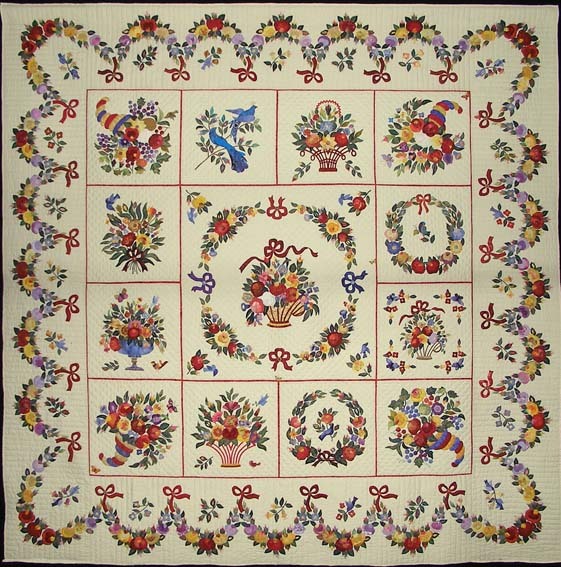 All images courtesy of the quiltmaker, June Brown. made or concluded between 3 parties. Each artist then explores the chosen theme within a series of 3 sets of 9 small studies which, when combined, will fill an area measuring 75 cm X 99 cm. To compliment each set of studies, a large textile work measuring 75 cm X 99 cm will be created. The complete exhibition comprises of 18 pieces of work.